GIE+EXPO organizers are calling the event a success, despite a few weather-related snafus. 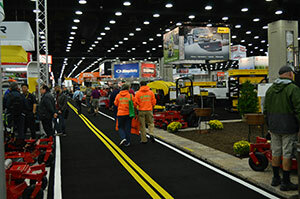 The 2016 GIE+EXPO, held Oct. 19-21 at the Kentucky Expo Center (KEC) in Louisville, topped the last two years’ records for attendance and exhibitors. Stormy conditions Oct. 20 shut down the outdoor demo area for part of the day and knocked out power on a portion of the trade show floor. Still, more than 22,600 people attended, a 12 percent increase in registration over last year. Contractor registrations were up 17 percent over last year’s 11 percent increase; 44 percent of lawn and landscape attendees were first timers. GIE+EXPO is sponsored by the National Association of Landscape Professionals (NALP), Outdoor Power Equipment Institute (OPEI) and Professional Grounds Management Society (PGMS). The Outdoor Demonstration Area, where GIE+EXPO attendees could test out equipment, took up 20 acres, up from 19 acres last year. 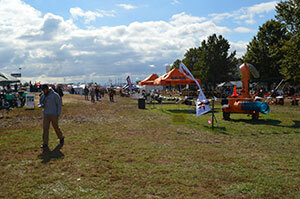 There were more than 900 exhibits at GIE+EXPO and Hardscape North America (HNA), including 230 new exhibitors. The New Products Showcase sold out with a record number of companies (76) spotlighting more than 100 products that were introduced within the past year. The Outdoor Demonstration Area covered 20 acres, up from 19 acres last year. The indoor show floor was 80,000 square feet larger—a 17 percent increase over 2015. NALP said 1,800 landscape professionals attended its Landscapes 2016 conference and the association netted 42 new company members during the two-day trade show, the second highest recruitment total ever at GIE+EXPO. The dates for the 2017 show in Louisville are Oct. 18 for dealers, distributors, retailers and media and Oct. 19-20 for everyone in the industry. Related: See all the LM GIE+EXPO coverage here.